All HSN members believe strongly that Canada and the United States play a fundamental role in the social, economic, and political context in Honduras. Together with the Honduran social movement, HSN members are committed to denouncing and opposing US and Canadian imperialism, neoliberalism, and the role of the International Financial Institutions (IFIs) in generating poverty, inequality, insecurity, and violence in Honduras. As US and Canadian citizens, it is our responsible to oppose and educate our communities in North America about what the decisions of our government and their impacts, in relation to Honduras and the Central American region. 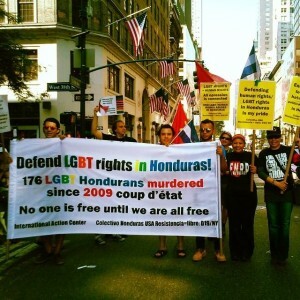 To denounce violations of human rights in Honduras, the United States, and Canada, and demand their investigation so that intellectual authors and material perpetrators of these crimes are punished.